I have the fondest memories of the summer reading program as a child. My teeny tiny hometown had an equally teeny tiny library, and consequently, the book selection was somewhat limited (but our awesome librarian would basically inter-library loan anything we wanted, so it didn't matter), but the summer reading program was amazing. I loved to read anyway, but because of that program, I definitely dedicated a large percentage of my summer logging away more time. I didn't even realize what a lucky kid I was until I signed up little Aaron for his first summer reading program. 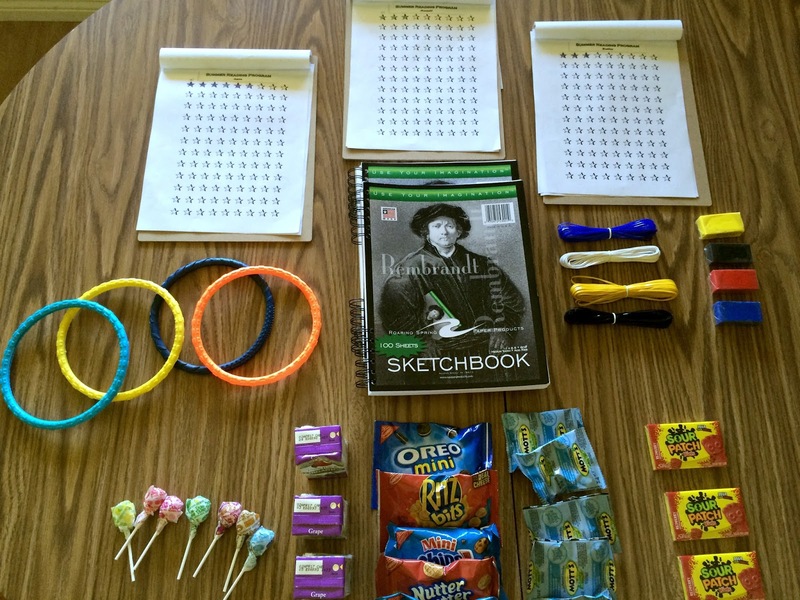 Of course, having only my own experience to reference, I was filled with eager anticipation, but it wasn't anything like what I was used to: kids could earn a total of four prizes (no matter how much they read) and each prize was pre-assigned. 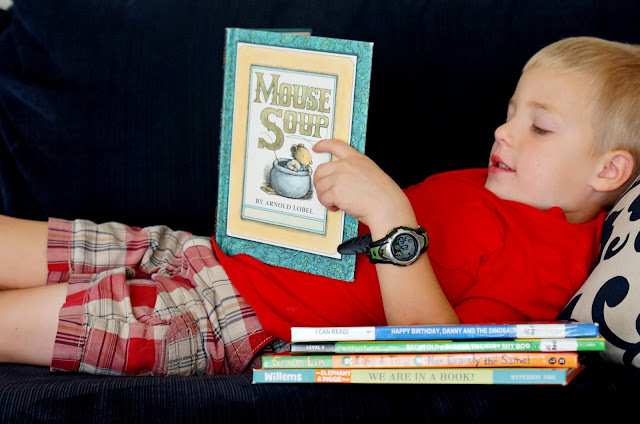 I guess it maybe motivated kids who weren't already readers to keep up their habit of 20-minutes of school reading (but maybe not--the prizes were rather lame), but it certainly didn't push kids who were already strong readers to read more. It was one of those moments where I realized growing up in a teeny tiny town definitely had its perks. As the years went by and my own kids got older, I grew increasingly frustrated with the library's summer reading program. It almost didn't seem worth the hassle of filling out a chart and remembering to take it in for what basically seemed like a consolation prize. I kept thinking, If you don't like it, why don't you just do your own? And finally this summer, I decided to do just that. Now before I give you all the details, I want to address one other thing, call it a justification, if you will. A few weeks ago, I read this line on Janssen's blog: "We don't want kids to read to get a donut or a free pizza. The reward for reading is more reading." It stood out to me because, at that very moment, tucked away in a couple of boxes in our storage room and also placed out of reach on a shelf in my bedroom closet, were literally dozens of prizes . . . for reading. But instead of feeling offended or like I'd just ruined my kids' chances of ever enjoying reading for reading's sake, I just laughed because honestly? This summer reading program has been one of the highlights of our summer, and I wouldn't change a thing about it. I'll get into the details below, and you can judge for yourself (and of course, leave your own opinion in the comments). Of course it's not going to work for everyone, but we are very much a family of charts and graphs and goals and external rewards, and so it was just the thing to kick up our summer a notch. 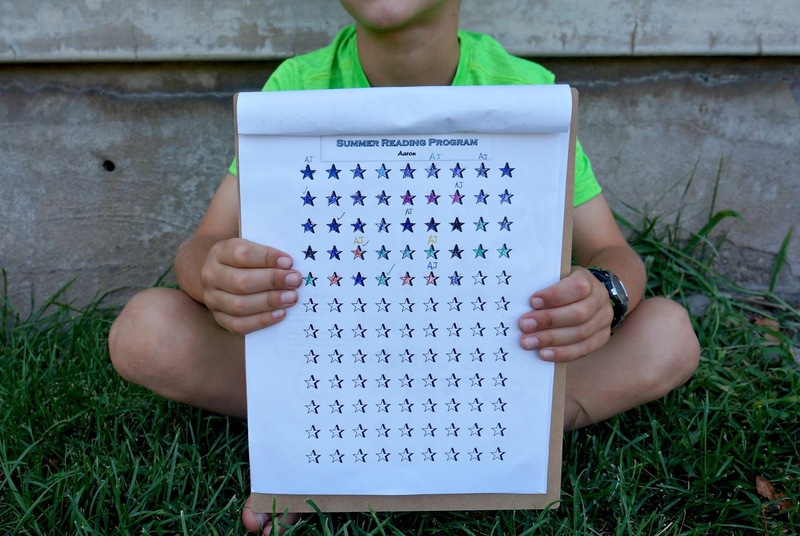 I had Mike make a simple chart for each boy, containing several rows of stars. Every time one of them hit two hours of reading (or one, in Bradley's case), they colored in a star. This required them to keep track of how long they were reading. Bradley and Aaron both wear watches (this one), and so they used the stopwatch feature to time themselves. Maxwell can't handle wearing a watch, so he kept track of his time on an iPod. Aaron was already a pro at this, having timed himself all year for school, but it took some effort to train Bradley and Max. Many times they either forgot to start their time, or they accidentally cleared it before they got to two hours. But eventually, they got the hang of it, and it's been smooth sailing ever since. Single-serving bags of chips, crackers, cookies, fruit snacks, etc. Juice boxes, small cans of soda, etc. If you're not into physical prizes, you could always reward with screen time, outings, one-on-one time, etc. The great thing about doing it yourself is that you only offer the kinds of prizes you want your kids to have. Many of the above prizes were things I might have bought anyway to fend off summer boredom, but this way, I got to reward them with it instead of just handing it to them. 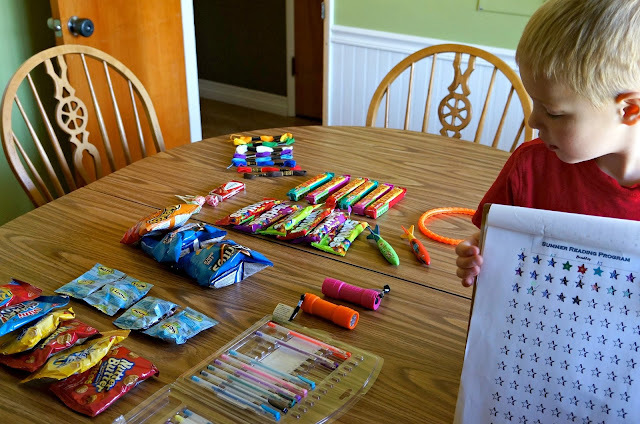 And I know some parents won't agree with the food, but I was okay with it because it was a treat, and my kids usually saved what they got and slowly rationed it to themselves throughout the week. Once a week, usually on Fridays, I set out all the prizes on the kitchen table. My kids came in with their charts. We started with Bradley, and he chose his first prize; then it went to Maxwell, then Aaron, then back to Bradley until they'd received all their prizes. Then I initialed on the last star they filled in for the week so we would know where to pick up on the next week. For every twenty hours my kids read, they earned a book, and you can probably guess that I kind of enjoyed having an excuse to buy more books. Some of these came from the thrift store, some from Amazon, and some from ThriftBooks. Here are the books I got for each boy (they didn't read enough to earn all of these, so now I'll just save them for birthdays or other rewards). I've mentioned this on Instagram, but Aaron and Max were on a major Calvin and Hobbes and Garfield kick for most of the summer. 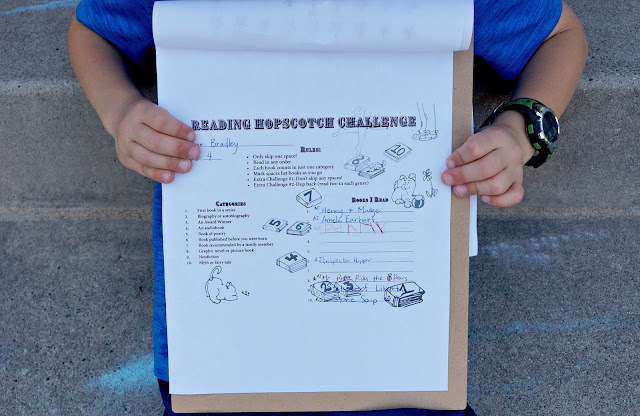 I was okay with it but didn't want it to make up all of their reading time, so in addition to their reading charts, I also printed off Carolyn's Reading Hopscotch Challenge, which had ten different categories to fill in (for example, a nonfiction book or a book published before you were born). For every category my kids filled in, they earned a bonus prize. School begins this week (today actually), but I'm going to continue to do the program through the end of the month. We'll see how my kids feel about reading after the incentives are removed, but I'm not worried. I have seen benefits all around: Because Aaron was reading for several hours a day, he was no longer so intimidated by big, thick books. Because Maxwell got rewarded for reading something besides animal books, he became more of an adventurous reader (he read the entire Captain Awesome series, and even though they're not high quality books, they were so different from his usual fare that I was very pleased). Because Bradley read on his own every day, he transformed from struggling to fluent reader. I have no doubt that we'll do something similar next summer (or maybe exactly the same--at this point, I can't think of a single thing I'd change). From the way my kids have enjoyed it and talked about it, I know they're creating the same fun memories I did when I was a kid, and that makes me really happy. So tell me: Would you do something like this with your kids, or do you think reading should always be its own reward? How would you adapt something like this for your family? I totally think this kind of incentive is fine and makes reading more fun. Your family already has a major culture of reading - this program is intended to stretch your readers, push them to read more and differently and set summer reading apart from regular reading. I see that as wildly different from a child who never has positive experiences with reading and sees reading ONLY as a tool to earn a reward, not something that is inherently fun. Also, I loved my summer reading programs growing up too :) Your library should hire you on next summer to run their program! The library program was so disappointing this year! Next year I'm giving yours a try! Not all my kids (Jane) are highly motivated by physical prizes so I might have to come up with something for her, but I love it! Good work! I agree...there wasn't anything motivating or fun about it. :-( But I think the great thing about putting together our own is now I don't even really care how lame the library's is--it was kind of empowering. Let me know what you end up doing next year! I love the idea of getting things you'd be buying anyway as incentives. We went through too many swimming pool toys this summer-somehow they get swiped every few weeks at the pool. Last week we turned in our "marathon" record and the librarian told my kids, "you won't win; there are thousands of entries." Motivation killer. I'm curious how you get Bradley to read on his own. Liam is reading (early second grade level) but just with me. He spends loads of time looking at picture books and early readers but when I ask him about them he admits that he doesn't even try to read the words. When my kids went to pick up their book for the library's summer reading program, the librarian asked if we were interested in the "Super Reader Challenge," which would give them an extra entry in the drawing. I told her no thanks--it doesn't seem like a bonus entry in a contest with thousands of entrants is that exciting for a four-year-old. I'm afraid I haven't much advice as far as how I get Bradley to read on his own. Having had Aaron and Max before him (who sound a lot like Liam), I can see that Bradley is just a VERY different kid in terms of self-motivation and interest. He has really pursued reading on his own (and I pushed it with Aaron and Max). The one thing we have done over the summer is have "quiet reading time" in the afternoons, where we all find our own quiet place and read to ourselves. I think that has given him some added confidence to get a stack of books and read them all on his own because he's been given the time and space to do it. However, I would say that if Liam is already reading that well, I wouldn't worry at all if he's just looking at the pictures and not attempting the words sometimes. It's obvious he has a love of books, and since he also has the skills, he will gradually start paying attention to the words too. My advice for those kids who don't enjoy reading is getting the book and the audio book. My 7 year old with slight autism has gone from fighting reading, to sitting in his room for hours, listening to the book and following along. Thank you Diary of a Wimpy Kid (he loves the drawings, which keept him following along! He literally listened to 1.75 books on saturday and was crying when we made him turn it off for bed. I also read an article that listening to the book is just as good for your brain. He'll still probably need to work on some reading out loud skills, but to forget to nag me about watching t.v. because he's on his second book of the day....I'll take that as a win! What a great suggestion, Carolynn! It's so awesome when a book has more pull than a show! Ooo...i'm curious abt that^^^ too. I think the Summer Reading Consortium is responsible for many of the public library SRP's getting watered down so much. Entire states are banding together to produce the materials, and they send out a big binder (or probably an digital file now--ha!) 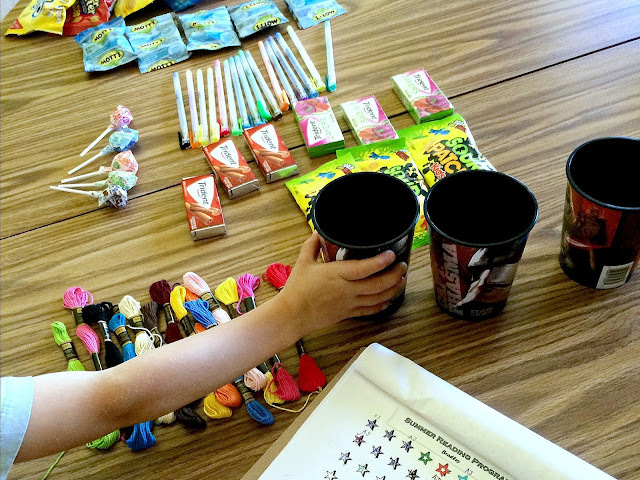 with ideas for activities that go along with the theme, plus posters, bookmarks, reading logs, etc. As a part of all of that, it's been very streamlined and simplified. Don't get me wrong--I think for some of these big libraries, it might be the only way to go. It would be crazy expensive to provide small incentive prizes all along the way for 4000+ kids every summer, plus books at the end. I agree with you though--for kids who are already readers, it's not particularly motivating. In fact, my kids and I keep forgetting to turn our logs in this month. Shows how into it we have been. So I love your idea here. How fun! My kids would LOVE it! My dad was a librarian, and I still remember an awesome summer reading program he did one year. He had this huge map of North and South America, and each kid had a marker of some sort. Then the minutes they read counted for miles on the map, so they would get to move their markers each week, and at certain cities or destinations they could collect prizes. It was so fun! I think you're right, Linnae. It makes sense, for large library systems especially, but it really doesn't provide much incentive (or magic) for kids. And your dad's summer reading program?! I'm totally stealing it. How fun! Now we're in Washington, and the libraries used to have nice summer programs (I think the money is running thin now, but my kids timed their childhood right) but nowadays the kids are burned out on tracking reading so they aren't that enthusiastic. No one did the Teen Summer Reading program (which was childishly simple -- 12 hours of reading. For heaven's sake, you can do that in a day!). Lucky for them the library started an Adult Summer Reading program so I could log my books and earn badges and generally be happy. You set your own #books goal and meet their hours goal, but you can also get badges by rating books and making lists. Yes, I have all the badges. In elementary years we'd make summer book chains at home -- cut construction paper into strips and write the titles on them and then glue them into interlocking rings. If I was super organized we'd have different colors for different kinds of books. I had two boxes, one for blanks that were filled out as you finish books, and then you put them in the other box, and every week or so we'd assemble the new slips and add them to the chain going around the kitchen and into the living room and .... It was fun. For Michelle's Liam, I'd suggest finding a lot of wordless books for him. (David Wiesner is amazing!) Encouraging his love of story and reading and convincing him that he's a "reader" is probably worth more than getting his lexile score up at this point. Maybe some audio books or combine a picture book with an audio book so he can hear and see the words on his own? I agree that the chart can be its own motivation, but only (in my opinion) if it doesn't restrict the number of minutes per day you read. I think you've mentioned the summer book chains before, and it's such a fantastic idea. One of these years, we're going to do it! I love your reading suggestions. I agree with you that the main goal should just be in maintaining an enthusiasm for books and "reading" (whether there's any actual reading going on or not). Oh Jan, you're the best! Thanks to those of you who chimed in with your own suggestions and recommendations for Michelle and Liam! I've always wanted this space to be a place where we can all share ideas and have a conversation. Thanks for making that happen! So, I am looking at possibly doing this this year. Are you going to repeat it? Change it up? I think my son just needs a bit more incentive. Also, I would really love to print out your chart. ;) Any chance of getting a copy of that file.